Our version of this classic English recipe is made with strawberries, butter and crème fraîche. We also blend in yogurt for a delightfully surprising texture, along with a dollop of strawberry filling. An ideal bite to enjoy with your tea or coffee. 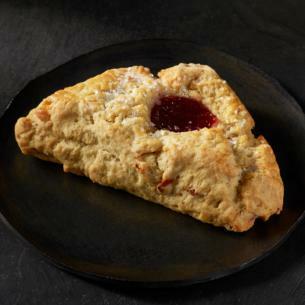 scone (enriched wheat flour [wheat flour, niacin, reduced iron, thiamine mononitrate, riboflavin, folic acid], butter, buttermilk [cultured milk, nonfat milk, food starch modified, salt, mono and diglycerides, sodium citrate, calcium sulfate, locust bean gum, polysorbate 80, carrageenan], cultured pasteurized cream, yogurt confectionery [sugar, palm kernel oil, nonfat milk powder, yogurt powder (cultured whey and nonfat milk), lactic acid, soy lecithin (emulsifier)], sugar, strawberries, baking powder [sodium acid pyrophosphate, sodium bicarbonate, corn starch, monocalcium phosphate], natural flavors, baking soda, salt), filling (sugar, corn syrup, water, strawberries, contains 2% or less of the following: pectin, citric acid. natural flavors. sodium citrate. natural color [fruit and vegetable extracts], calcium lactate gluconate), liquid whole eggs, sugar.